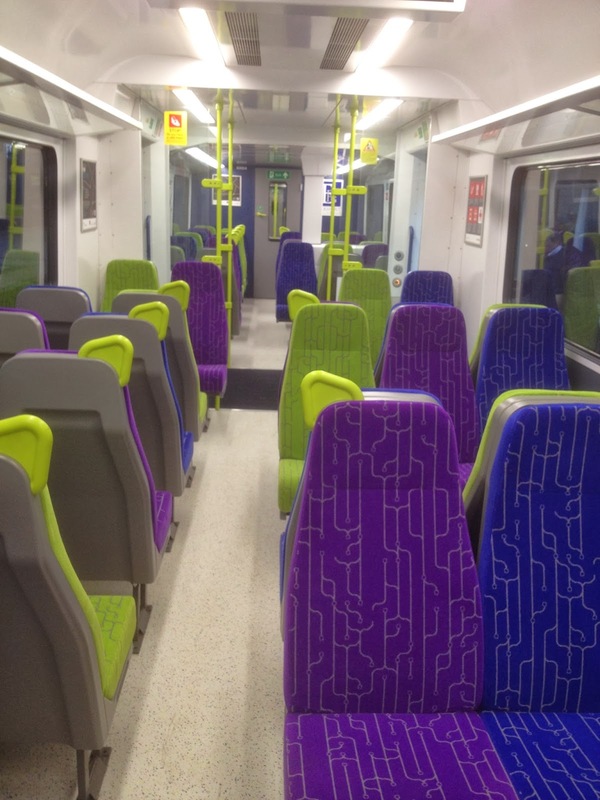 The expected fare increases have been announced with the Annual season ticket from Manningtree to Liverpool Street going up from £5,060 to £5,232 - an increase of 3.4%. Harwich to London will go up from £5,104 to £5,312 - an increase of 4.07%. The increase kicks in on 2nd January. Eversholt Rail Group, the company that owns the Class 321 trains (the older sliding door trains that stop at Manningtree) used by Greater Anglia (GA), in conjunction with Wabtec and GA has completely rebuilt one of these trains to see what could be done to bring them up to date. Although they are now over 20 years old they are considered to be only halfway through their working lives. However, they are looking very shabby and are in desperate need of a major overhaul to incorporate features that reflect the needs of today. Features include air conditioning and new heating; Sealed windows; LED lighting; Leather seats and Power sockets in 1st Class; Refurbished standard toilet; New wheelchair accessible toilet. Eversholt has effectively split the four carriage train into two to evaluate different seating arrangements. 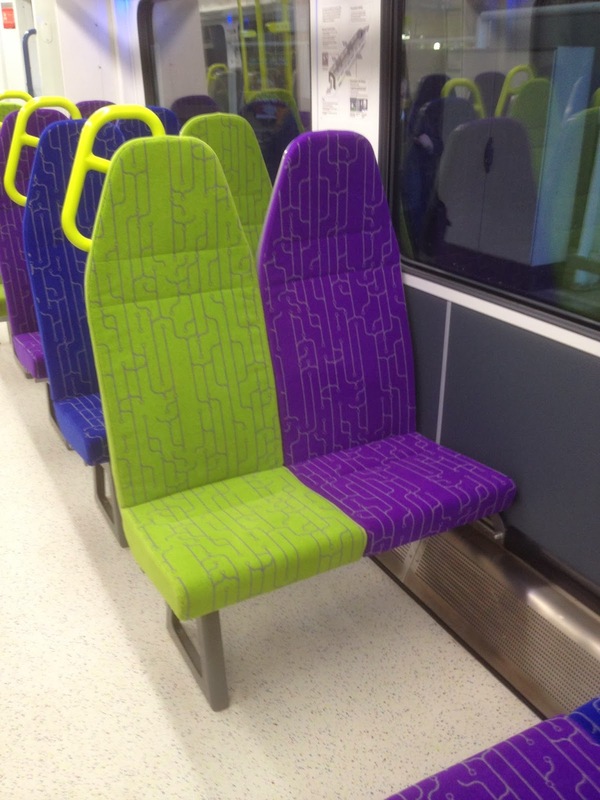 Two carriages have the conventional 3+2 seating that we currently have and is designed for longer journeys. These seats have been raised slightly when compared to the current model which will please some but they are still quite cramped when 3 people try to sit together. To provide more space for the seats reserved for those less able, the seats facing each other in the middle of the carriage are very close together. So much so, passengers would have to sit with their legs intertwined! The other two carriages have been fitted out with 2+2 seating. With fewer seats in this configuration, there is much more standing room with extra space around the exits. 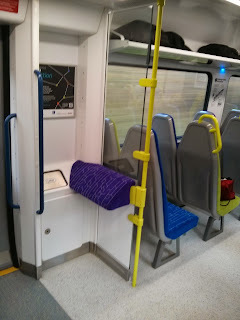 However, apart from the handles on the seats as visible above, there are no grab handles, on the ceiling for example, to hold onto. The added space next to the exists incorporates bench type 'seats' to lean against. 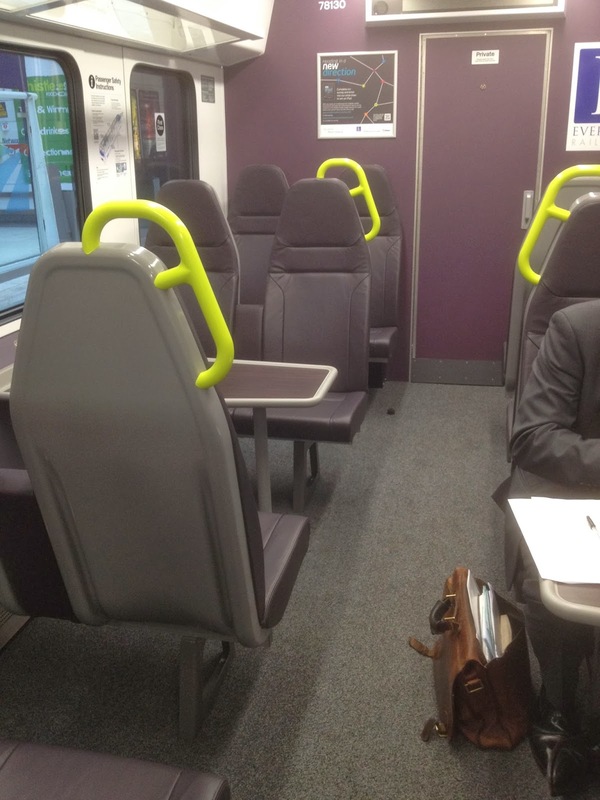 There are new leather seats in 1st Class where there are also power points fitted. 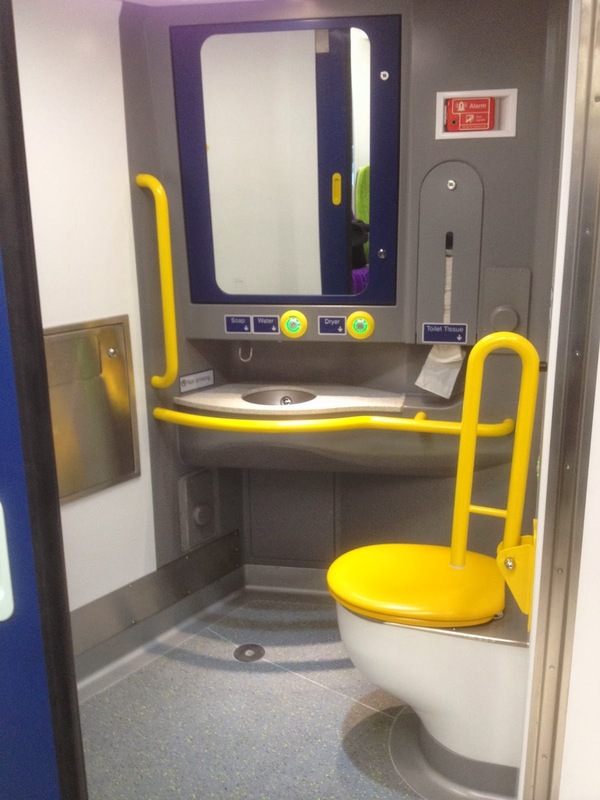 The current model has 2 toilets and one of these has been removed with the remaining one having a complete refurbishment. In addition however, there is now a wheelchair friendly toilet too. A number of carriages are out of service having 'wheel flats' corrected - a condition caused by slippery rails conditions. A number of carriages are out of service at any one time undergoing heavy maintenance under a periodic programme that takes place every few years. The cover usually provided for such maintenance has been reduced by the wheel flats issue. Following accident damage to a couple of Diesel Multiple Units (DMUs) elsewhere on the GA network a couple of Inter City carriages (hauled by a diesel) are being used in their place. GA are trying to source replacement DMUs but at the time of writing there are none going spare in the UK. Passengers may have noticed that a number of Inter City services are missing a carriage, something that is particularly apparent in the morning peak period. The MRUA has asked for an update on how long this is likely to continue.